This is my recreation of a delicious little dish I once ate in a simple whitewashed cafe in Cadeques in Northern Spain. Washed down with a rustic red, it was heaven on a plate. If you want it to taste it at its most delicious slip each bean, once cooked, out of its leathery skin. The skins of large broad beans have a slightly bitter taste which most people don’t like. This is fiddly so do this when you have a bit of time, for a special meal, or at the weekend! 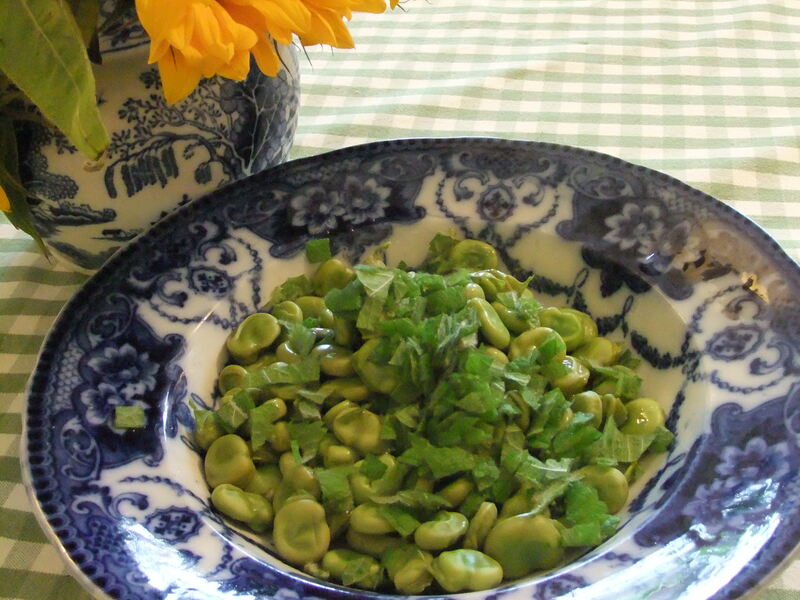 If you are lucky enough to get baby broad beans (not much more than 1cm long), you can leave them in the skins as they are not bitter. This is nicest eaten lukewarm, in my opinion. You can make it in advance but do allow it to come to room temperature before serving, or warm it very gently in a pan until lukewarm. For 2 as a starter, with leftovers. If you have fresh beans, pod them. If the beans are large, steam for around 5 minutes. If they are baby beans, steam for around 3. You want them to be softened but not overcooked. Drain the beans, and as soon as they have cooled down enough to handle. Slip each bean out of its leathery skin and place in a bowl. Drizzle on enough extra virgin olive oil to coat the beans generously, sprinkle on a pinch of salt, and a few good grinds of black pepper. When the beans have cooled to lukewarm, add the mint (if you add it when hot, it will turn brown, which you don’t want). Taste, and adjust the amount of mint and seasoning. Eat a small portion as a starter, or a larger one as a main with a large mixed salad and maybe some cooked millet mixed with pesto. Beans and pulses are a rich source of soluble fibre, which helps nourish healthy bacteria in the gut. These bacteria make butyric acid that repairs the bowel and helps prevent abnormal growths. They also are important for detoxification of hormones, chemicals and naturally-produced toxins – all good news for skin, energy levels and a healthy digestion. Beans are also rich in magnesium which helps keep you relaxed as well as supporting healthy bowel function. Mint has soothing, anti-spasmodic properties in the digestive system. Extra virgin olive oil is rich in vitamin E and health-enhancing polyphenols. The Italians always say that raw olive oil give you smooth skin and they are right. Olive oil also helps weight management and delays the effects of ageing. If you have difficulty digesting beans then this is a sign that you may need to pep up your gallbladder function or address a possible imbalance of bacteriai in the gut.